Alternately titled, "My Summer Obsession." 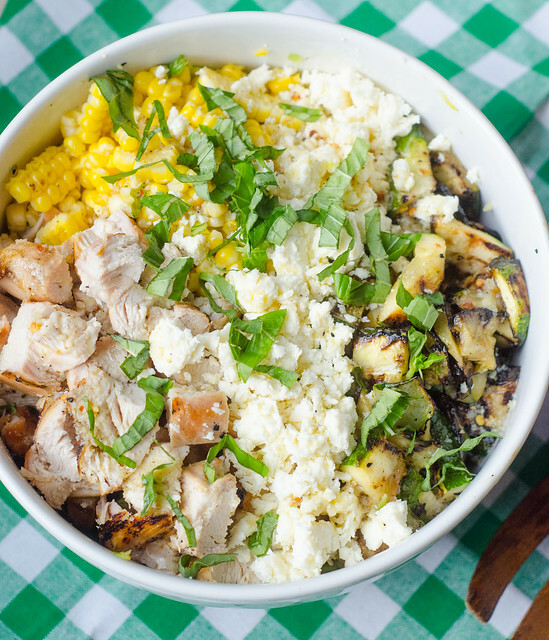 Or "Grilled Romaine Salad with Chicken, Zucchini, Corn, and Feta, with a Spicy Lemon-Garlic Dressing." Do you see why I went with "Grilled Summer Veggie Chopped Salad?" But no matter what you call it, this salad IS my summer obsession, and with the veggies coming into their primes, I see no signs of that slowing down any time soon. My nutrition and diet as of late haven't exactly been ideal, and this salad has been a great way to kind of "reset." It's healthy and light, but it's really filling and really delicious, so I don't feel deprived or bitter about giving up french fries. And isn't there something so great about chopped salads? I don't know what it is, but I just love them. A few weeks ago, my sweet friend Courtney and her sweet family stopped by our house on their way through Atlanta. We of course wanted to cook together, and the original version of this salad was on the menu. A seemingly simple grilled salad of corn, zucchini, and feta, this salad ended up being my favorite dish of the night. We all raved over it, and I haven't stopped thinking about it since. The following week, I was craving it again, but this time I bulked it up with the addition of grilled chicken and grilled romaine. And then the next week, I made it again. You can see where this is going. If you've never had grilled romaine, I know it sounds kind of weird, but just trust me. Grilling the romaine hearts gives them a great char and a little smoky flavor, but since they're only on the grill for a few minutes, they don't get gross and mushy. Like I said, you have to just trust me on this that grilled romaine is amazing. This is an easy dinner, one that only dirties a few dishes, it's healthy, and it celebrates the produce of the season. Will you pretty please make this for dinner tonight? Brush the zucchini, corn, and romaine with oil, then pour about 1 tablespoon of the oil mixture over the chicken breasts, Brush them with the oil then discard the brush (In other words, don't dip it back into the mixture, because it will contaminate the oil since the chicken is raw!). Reserve the remaining oil mixture to use for the dressing. 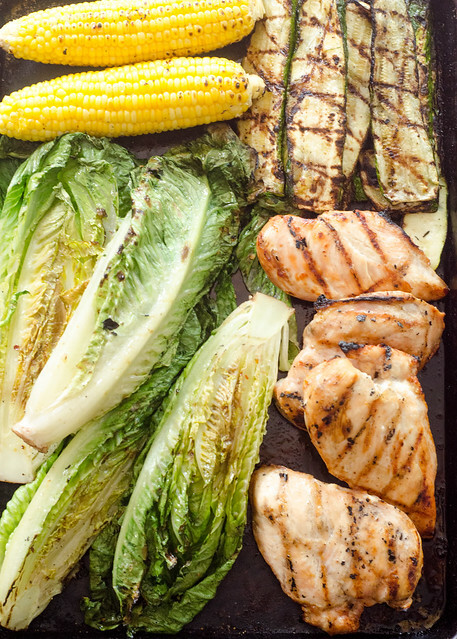 Clean the cooking grate, then place the chicken, zucchini, romaine, and corn on the grill. This may need to be done in batches, depending on the size of your grill. But definitely start with the chicken since it takes the longest to cook. For the chicken, grill it about 7 minutes per side, or until it reaches an internal temperature of 160 degrees. Remove from heat and cover with foil. For the romaine, grill it 1 to 2 minutes per side, or until it is very lightly charred. Once everything is off the grill, begin building the salad. Chop the romaine hearts into bite-sized pieces and add them to a large bowl. Cut the kernels off the corn and add them to the romaine. Cut the zucchini crosswise into 1/2 inch-thick slices, and add those as well. Chop the chicken into bite-sized pieces. Crumble the feta into the bowl, and top with the chopped basil. Drizzle the dressing over the top, then toss well to combine. Divide among plates, then lightly sprinkle each serving with salt and freshly ground pepper. Serve. The perfect summer meal! I wish I had a big bowl right now! I'm so happy you posted this, I've been hoping that you would! It's sounds and looks so good, I can't wait to try it! These look awesome! Nice photos, too. What a great idea. I like that you added the chicken. It makes it more like a picnic salad. I could totally see myself being obsessed with all these fun salad mix-ins! I went to a wedding this past weekend and am now at a conference so I am definitely going to need to reset when i get home. Guess I know what I'll be making!